Executive Outcomes' intervention in Angola was a decisive moment in the emergence of the modern 'private military company'. Hooper's account is very much the official version, consisting primarily of the reminiscences of EO officers. The opening sections feature anecdotes from South Africa's border wars, which are portrayed as a heroic struggle against communism. The end of the Cold War paved the way EO's personnel to turn on their former UNITA allies by signing up to fight for the Angolan Government, an about-turn which, according to Hooper, caused more tensions with old SADF colleagues than with the new ANC Government. An initial operation to seize the Soyo oil refinery in 1993, was followed a year later by EO's participation in a decisive campaign to oust UNITA from Angola's main diamond fields. Hooper's account will prove satisfying to military buffs, but has little to say about the wider issues raised by EO's intervention. 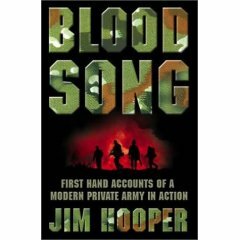 There's seems little doubt that the company was an effective force in Angola and Sierra Leone, (which is covered in an appendix), but Hooper glosses over the quid pro quo exacted by the company's backers in the oil and mining industry, an issue covered more fully by Margaret Drohan's Making a Killing. Bloodsong is an important source for the events it covers, but one which should be approached with caution. Could someone please help me i am trying to locate Jim Hooper, writer of KOEVOET! Hi Patrick, if you want to drop me a line my email is tom@tomgriffin.org.